At the Produce Marketing Association’s Foodservice Conference and Expo last month, one demonstration challenged chefs to create kid-friendly menu items that met the MyPlate guidelines of half the plate being fruits and vegetables. The winning recipe—as selected by a group of children judges—was from Chef Doug Goettsch, of The Mushroom Council. Goettsch’s The Swapable Meat-Mushroom Taco uses a 50/50 mix of mushrooms and ground beef for the taco’s filling. The Mushroom Council says that by making the 50/50 mushroom-beef mix, recipes can have 41% fewer calories and 50% less fat. 1. Place all ingredients except cilantro and avocado in blender. Process until smooth. 2. Season with salt. Add cilantro and avocado and briefly blend until smooth. 1. Heat skillet. Add oil and sauté garlic until golden, approximately 2 minutes. Add onions and spices and cook for another 2 to 3 minutes, slightly toasting spice blend. 2. Add tomato paste, ground beef, cooked mushrooms and salt. Stir well. Add water as needed if mixture is dry. Bring to a simmer. 3. Heat tortillas over hot griddle for 30 seconds on each side. 4. 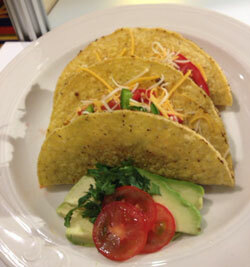 To assemble: Fill tortillas with 2 ounces mushroom-meat mixture. Top with lettuce, Avocado Salsa Verde and queso fresco.